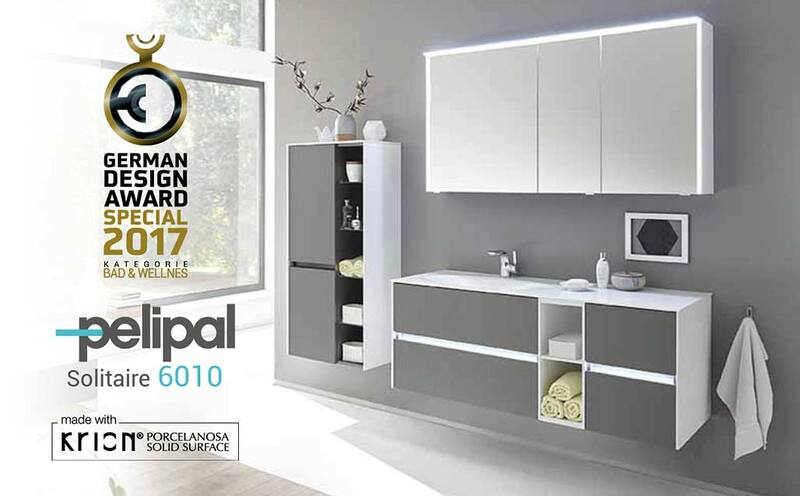 The company Pelipal, located in Schlangen, in the Ostwestfalen-Lippe region of Germany, is a leading manufacturer in the bathroom unit and cabinet sector in Europe. It forms part of the Pelipal Group which has an international sales network with subsidiaries and partners in 15 European countries. Founded in 1906, it has since then enhanced the value of the “Made in Germany” seal with Quality and Reliability. In 2017, it won the prestigious German Design Award in its “Bath & Wellness” category for the Solitaire 6010 series, manufactured with the solid surface from PORCELANOSA Group, KRION. The collection is a play of proportionally balanced symmetries, characterised by its clean lines, unpretentious elegance and maximum comfort. Pelipal selected the solid surface KRION due to its multiple properties. The best qualities provided by the Solitaire 6010 series are: durability, easy cleaning, non-porosity, high resistance to chemical products, imperceptible joins, impact resistance, and very importantly commitment to the environment, being organic and 100% recyclable. The German Design Awards have been granted since 1969, being official design awards granted by the German Ministry of Economy and Technology. To win this award, the company or studio must have previously won a national or international design award, giving Pelipal even greater distinction. We would like to take this opportunity to congratulate you, and thank you for your confidence in our material KRION. CONGRATULATIONS PELIPAL!! !